No matter how well the ice & snow are removed from campus streets & sidewalks, people will encounter slippery surfaces when walking outdoors in the winter. 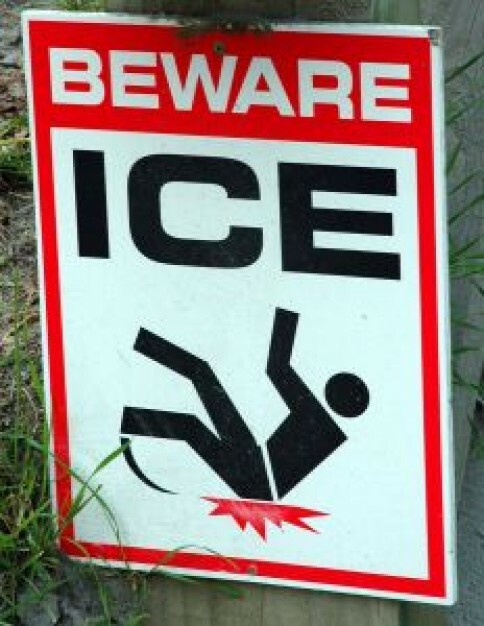 Many cold weather injuries are the result of falls on ice-covered streets and sidewalks. Getting around in icy conditions calls for planning, caution, and a little common sense. Whatever you wear, make sure it doesn’t block your vision or make it hard for you to hear traffic. Plan ahead and give yourself enough time. When walking on steps, always use the handrailings and plant your feet firmly on each step. It also helps to stop occasionally to break momentum. Dew or water vapor can freeze on cold surfaces, forming an extra-thin, nearly invisible layer of ice that can look like a wet spot on the pavement. It can happen early in the morning or in areas shaded from the sun. A heavy backpack or other load can challenge your sense of balance. Try not to carry too much—you need to leave your hands and arms free to better balance yourself. Be prepared to fall and try to avoid using your arms to break your fall. If you fall backward, make a conscious effort to tuck your chin so your head won’t hit the ground with full force. Notice that floors and stairs may be wet & slippery—walk carefully. Walk on sidewalks if possible. If sidewalks are covered with snow & ice, one option is to walk along their grassy edges for traction. Taking shortcuts through areas where snow & ice removal is not feasible can be hazardous. As if there wasn’t enough danger of falling on ice, you must be aware of ice that might fall on YOU! Watch out for: Icicles hanging from eaves, sheets of ice on sloping roofs, and tree branches covered with ice. They can fall quickly and silently. Before stepping off the curb, make sure all cars and trucks have come to a complete stop. Due to poor road conditions, motorists may not be able to stop or slow down for pedestrians. This entry was posted in General and tagged Ice, Safety, sleet, Snow, winter. Bookmark the permalink.